The easiest way to prepare broccoli is to cut it up into florets, and thinly slice the stalk (I never throw it out! ), put it all in a pyrex bowl with about an inch of water, cover it with a microwave cover or some saran wrap, and steam it for five minutes in the microwave, and drain. (Or you can steam on the stovetop – same amount of water, and a couple of minutes more – just one more pot to wash). Then you can use any of these delicious preparations to jazz up the stuff. 1. The Classic: salt, pepper, and a couple of squeezes of lemon juice. Add some fresh parsley, or red pepper flakes for an extra kick. 3. Lemon juice, salt, pepper, and a generous dose of parmesan. 4. In a pan, sautee a few cloves of fresh garlic, minced, in some olive oil. 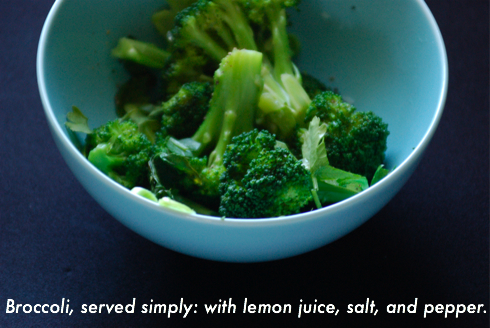 Toss in steamed broccoli, and serve. 5. Asian style: saute some garlic, ginger in a bit of vegetable oil, toss in steamed broccoli, and a splash of soy sauce, and a tiny hit of sesame oil. Add sesame seeds if you have them. 6. Toss broccoli in your favorite salad dressing. Just like salad – it’s great. 7. Toss with a drizzle of olive oil, pine nuts, basil, and parmesan (deconstructed pesto). 8. South Asian: Toast 2 teaspoons cumin seeds, 2 teaspoons fennel seeds, and 1/2 teaspoon ground cardamom, and grind in a spice grinder. Mix spices into one cup plain yogurt, add a tablespoon of olive oil, salt, pepper, and a the juice of a lemon. Toss in the broccoli. These individually make nice lunches, served with some fresh bread (or Naan, for the South Asian style), or as a side to any meal. You could easily make each of these into the star for dinner by tossing the dressed broccoli in some pasta. Add sausage and tomatoes for more substance, or for vegetarians, add tofu, or cannelini beans.